Casey Crosbie, RD, CSSD, is the program director and lead dietitian at The Healthy Teen Project, a program for adolescent eating disorder recovery in Los Altos, CA. She has been published in Nutrition in Clinical Practice and in the Journal of Adolescent Health. Wendy Sterling, MS, RD, CSSD, a specialist in eating disorders and sports nutrition, maintains a private practice in Menlo Park and Los Altos, CA, and has been published in the International Journal of Eating Disorders and International Journal of Adolescent Medicine and Health. “I highly recommend this book to any parent whose child has an eating disorder! 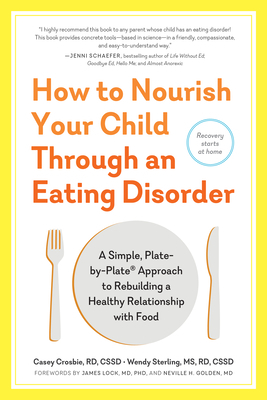 How To Nourish Your Child Through an Eating Disorder provides concrete tools—based in science—in a friendly, compassionate, and easy-to-understand way.